The Dunes continue to erode on the West Beach as the High tide backed by a strong wind from the North comes in. 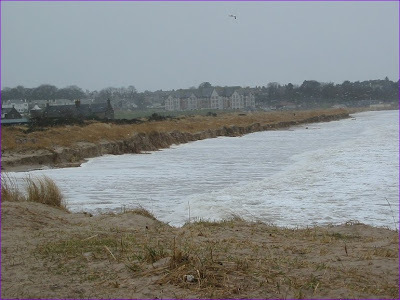 Wow, there's not a lot between the sea and the Fishertown, and it seems to be eroding fast. I think it's fair to say that the dunes in this area have built up significantly in recent years but, nonetheless, they were disintegrating at a remarkable rate today.